Exporter of a wide range of products which include forged bars. Jayant Impex can offer VACUUM DEGASSING (VD) route Forged Bars, Forged Round Bars, Forged Bars & Rods, Round Corner Forged Bars (RCS), Sharp Corner Forged Bars (SCS), Black Forged Bars, Bright Forged Bars, Forged Square Bars, Forged Rectangular Bars, Forged Hexagonal Bars, Normalized Forged Bars, Annealed Forged Bars, Heat Treated Forged Bars, Quenched (Hardened) & Tempered Forged Bars. Length for Forged Bars: 10mm upto 6000mm depending on material grade & size. Type of Forged Bars: Hot Forged & Cold Forged. Forged Bars End Finish: SHEARED / BANSAW CUT / HOT- CUT WITH GRINDING/ Water Jet Cutting. From Jayant Impex Pvt Ltd, India, Maharashtra, Khopoli, Mumbai client can avail VACUUM DEGASSING (VD) route Forged Bars, Forged Round Bars, Forged Bars & Rods, Round Corner Forged Bars (RCS), Sharp Corner Forged Bars (SCS), Black Forged Bars, Bright Forged Bars, Forged Square Bars, Forged Rectangular Bars, Forged Hexagonal Bars, Normalized Forged Bars, Annealed Forged Bars, Heat Treated Forged Bars, Quenched (Hardened) & Tempered Forged Bars. If any requirements for Forged Bars, Forged Round Bars, Forged Bars & Rods, Round Corner Forged Bars (RCS), Sharp Corner Forged Bars (SCS), Black Forged Bars, Bright Forged Bars, Forged Square Bars, Forged Rectangular Bars, Forged Hexagonal Bars, Normalized Forged Bars, Annealed Forged Bars, Heat Treated Forged Bars, Quenched (Hardened) & Tempered Forged Bars kindly do contact us. 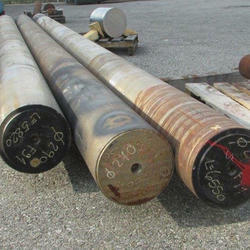 Looking for Forged Bars & Rods ?